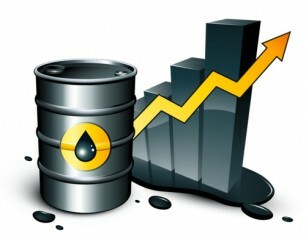 Oil prices rose to near $103 a barrel Friday in Asia amid signs the U.S. economic recovery remains uneven. Benchmark oil for May delivery was up 43 cents to $102.70 a barrel at late afternoon Singapore time in electronic trading on the New York Mercantile Exchange. The contract fell 40 cents to settle at $102.27 in New York on Thursday. Brent crude for June delivery was up 25 cents at $118.25 per barrel in London. Companies such as Morgan Stanley, UnitedHealth Group Inc., Southwest Airlines and Bank of America reported strong earnings Thursday. However, disappointing reports on U.S. jobs, housing and manufacturing weighed on investor confidence. On Thursday, an index of regional manufacturing compiled by the Philadelphia branch of the Federal Reserve dropped sharply, and the National Association of Realtors said home sales fell 2.6 percent last month. The Labor Department also said applications for unemployment benefits dipped 2,000 to 386,000. When the number is above 375,000, investors take it as a sign that hiring isn’t strong enough to lower the unemployment rate. Stock markets, which oil traders often look to as a measure of overall investor sentiment, fell in the U.S. on Thursday and in Asia on Friday. Crude has slid from $110 last month as tensions eased over Iran’s nuclear program. Negotiators from Iran and six world powers met last week and agreed to meet again in May. Investors have worried that a pre-emptive attack by Israel or the U.S. on Iran’s nuclear facilities would likely disrupt global crude supplies. “The Iran factor has been neutralized for at least another month until another round of negotiations provides guidance,” energy trader and consultant Ritterbusch and Associates said in a report. Natural gas rose 0.5 cents at $1.91 per 1,000 cubic feet after falling to the lowest level in more than a decade Thursday as U.S. supplies continue to grow. The Energy Information Administration said supplies grew by 25 billion cubic feet last week, putting the nation’s supply level at 58 percent above the five-year average. Unusually warm weather last winter in the U.S. curbed demand for heating, and some analysts expect natural gas consumption will likely rebound and push prices higher if weather follows more normal patterns. Capital Economics forecasts natural gas will rise to $4 by the end of this year and $6 in 2014. “The prospect of a return to more normal weather conditions is itself one powerful reason to expect the price of natural gas to rebound in the coming months,” Capital Economics said. In other energy trading, heating oil was up 0.2 cents at $3.13 per gallon and gasoline futures gained 0.1 cents at $3.12 per gallon.